Tango is a messaging app that TangoMe Inc. created in 2009. It has over 350 million registered users, with over 70 million actively using it. Tango supports text, voice, and video messaging over mobile and WiFi networks. Most of people use it to communicate with family and friends, while others may use it while working on their work projects.It is therefore possible that over time, users may accumulate sensitive information in their chats, and they may want to delete Tango chats from iPhone. Deleting the chats using Tango's delete button can hide the conversation. However, you need a more advanced tool to securely delete all sensitive data that is stored in Tango; otherwise third party recovery tools can recover it. Well, we are going to show you how to delete Tango chat history, messages and account data from iPhone XS/XS Max/XR/X/8/8 Plus/7/6S/6. But before getting started, we suggest you transfer iPhone data to computer for backup firstly. Just like most apps, Tango gives you a straightforward method that you may use to quickly delete messages. The method allows you to quickly get rid of messages from someone who may want to read them. However, it does not securely delete it from the phone's memory. Recovery tools can be used to recover the message fragments, and even piece them together. 1. Open your iPhone and go to home-screen. 2. Browse to the Tango app icon, and tap it to open Tango. 3. Tap on the specific chat containing the message you wish to delete. 4. Scroll to the message you want to delete, and then tap and hold it. 5. A pop message will appear, from which you should tap the "Delete" option. 6. Confirm you want to delete, and the selected message will be deleted. By now you may have found out that Tango does not allow you delete all messages at once. In order to delete all messages from a single conversation, you need to select the chat conversation first. The following are the simple steps to follow when deleting your Tango chat conversation. 1. Turn on your iPhone and head to the home-screen, or to the screen with your Tango app icon. 2. Once you see the Tango app's chat icon, tap it and it will open and list all your chat conversations. 3. If you have had the Tango app for a long time, the list will be long; otherwise it will be a short list. 4. In case it is long, you need to scroll up or down to find the particular chat you want to delete. 5. Once you have selected the chat you wanted to delete, touch and slide it to the left. 6. A delete button will appear next to the chat. 7. You won't get a second chance to confirm your deletion act, so be sure the selected chat is exactly the one you want to delete before you tap the delete button. 8. Tap that "Delete" button to delete the Tango chat from your iPhone. Again it is important to mention that when you delete the chat conversation, there are message fragments of that chat will remain in your phone for a long time. In order to securely delete your chat conversation or a particular message, you need to use an advanced deletion tool. In the last section of this guide, we will show you how to permanently delete Tango data from your iPhone. If you are tired of using the Tango app or you want a fresh start, you may want to delete it from your iPhone. Unfortunately, there is no automatic way to do it from your iPhone. You will need to get an "Tango account delete request" form, fill it, and sent it to Tango (fill out the form from here). Once you fill the form and send it, you must delete the Tango app from your iPhone, and restart it. The Tango deletion request will then be automatically proceed. Generally, you should make sure that the information you provide is true. Otherwise, they will not be able to identify your account. You only need to send the request just once. The account deletion will be done to the extent that it meets the legal requirement of the right to be forgotten of GDPR. As I mentioned above, all the data you deleted via the above ways can still be recovered by using high-tech iOS data recovery program. Therefore, if you have confidential Tango messages, videos, or audio recordings that you wish to get rid of permanently, use the professional iPhone data eraser - MobiKin Eraser for iOS to delete them. The tool can be used to delete everything from your iPhone XS/XS Max/XR/X/8/8 Plus/7/6S/6, as well as iPad and iPod touch. 1. Capable of erasing all data on your iPhone, iPad and iPod touch in 1 click. 2. 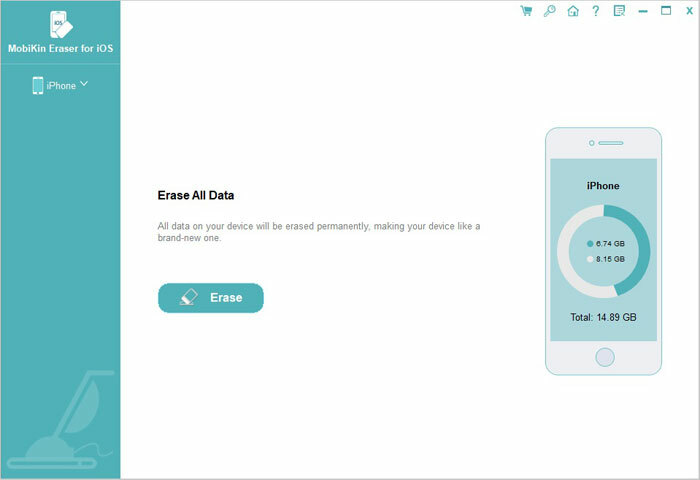 Erase all deleted files, private data, system settings and other files from iOS devices. 3. Provide low-medium-high erasing levels to meet different requirements for different people. Step 1. Install the iPhone Data Eraser to your PC or Mac, and then connect your iPhone to your Mac or PC using a USB cable. Launch the program and it will automatically detect your iPhone and display its basic information. Step 2. 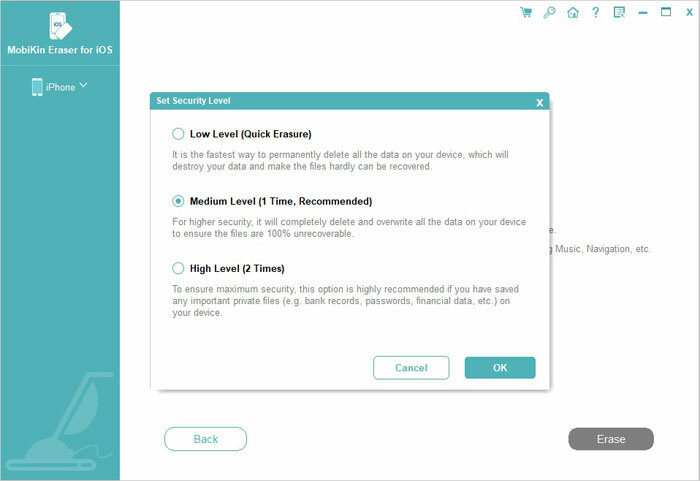 On the program interface, click on "Erase", and that will bring you a screen that allows you to choose the deleting security level you wish to use. A higher security level takes longer to finish the job, but is more effective. Step 3. After choosing the security level you wish to use in deleting your Tango data, type in "Delete" in the input box and tap on "Erase" button. Then, the data erasing process will start. Do not unplug your device and until the process is complete. Your iPhone will be restarted during the erasing process. Make sure the device has sufficient battery power, and your computer is connected to a power source. There are simple ways to delete your Tango messages, chat history and account information from your iPhone. The simple methods are fast, but not secure. 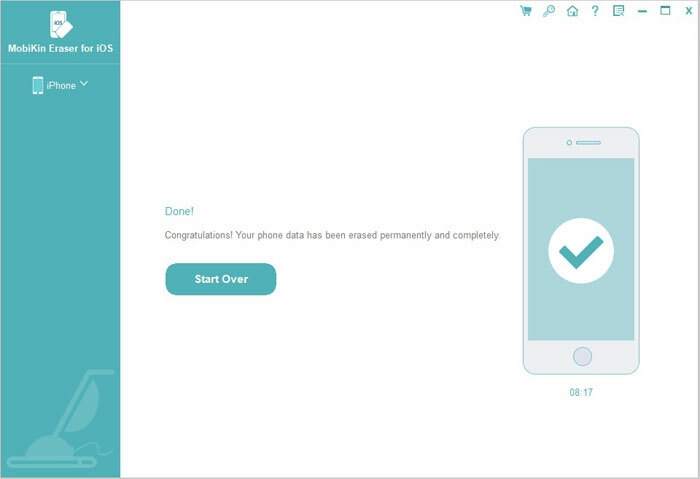 Using iPhone Data Eraser is the surest way to permanently get rid of sensitive data from Tango on your phone and erase data without any recovery possibility. Therefore, get MobiKin Eraser for iOS now to secure your privacy.